In every age of history, grain has been essential to human lives. Today Siam grain has dedicated to fulfilling consumers' needs for the best possible quality of this vital commodity. A stock of rice requires careful cultivation and tender attention as it grows from a green shoot to a golden head of grain ready for the harvest. Likewise with processing, care, effort and advanced technology are needed to assure that every bag of rice offers consumer world's standard hygiene and excellence. Our history began in year 1949, known as Sathien Rung Ruang Rice Mills Ltd.. or Liang Kee in Chinese. It was located in countryside of Chiang Rai province in Northern Region. This company was considered a pioneer in high grade Glutinous Sweet Rice and today its reputation for excellence in Glutinous Sweet Rice remained unchanged. Based on this initial success the company has grown and diversified itself into many business sectors as well as rice export business. In 1982, Siam Grains Co., Ltd. was established to export top quality glutinous rice to foreign markets. Later on, Siam Grains expanded its main product line to include Jasmine Fragrant Rice or Thai Hom Mali Rice and other varieties. Siam Grains now own 2 mills and 3 warehouse facilities in order to ensure that production keeps pace with demand. The quality of rice we produce depends on obtaining supplies from high quality fields. From every batch of rice unloaded on our trucks we conduct a number of elaborate tests in our most advanced laboratory to determinewhether it meets company's quality standard. Random quality testing at every stage of processing is also carried out from the very first stage until the final loading into a container. Based upon the quality of our products and the satisfaction of our customers Siam Grain has expanded the capacity to meet the growingdemand. In 1994, we constructed a 8,000 m2 factory and storage facility on Bangna-Trad road raising our capacity to 100,000 metric tons per year. 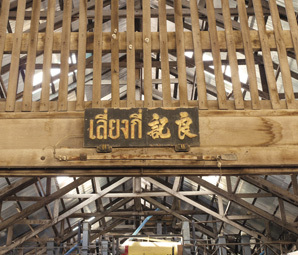 Siam Grain's export volumes continue to rise every year and in 2001 the company built the 2nd storage facility with 5,000 m2 space capable of holding 15,000 metric tons as well as enlarged and modernized its production capacity. Apart from obtaining the latest production, packing machinery and other type of modern technology, in order to ensure that the machineries are operate at optimum condition to produce the best quality rice for customers. Siam Grain also chooses our personnel with care. Their efficiency and skills in each stage of the work process helps to assure the excellence of the company's total output.